An error is something which will generate the difference between computed and correct value. For example, while using Cydia Impactor, you may face runtime error, http-win.cpp158, cydia impactor error 173 or any of such errors. These errors cause a significant delay for a human to get work finished. It is a natural behavior to become frustrated when such errors are not getting fixed. If you fail to solve encountered cydia impactor error while sideloading, you can try cydia impactor alternatives. Install Visual C++ Redistribution latest version. It may be caused by dragging IPA zip file directly to Cydia Impactor. Try to extract at the desktop and then drag it to software. Upgrading iOS version will solve the error. It is probably occurring because you are having a similar app on your iOS device. You already have a current iOS development certificate pr pending certificate request. There may be a problem with the certificate causing such action. Navigate to Xcode >> Revoke Certificates. Enter your Apple ID and password and revoke the certificate. The “Network Extensions” feature is only available to users enrolled in Apple Developer Program. Please visit https://developer.apple.com/programs/ to enroll. Utilize revoke certificate along with cydia impactor as demonstrated for 80 error. Create an new apple id and use it while cydia impactor asks. This will solve the actual issue. It may be because of invalid login credentials. However, if it does not disappear, go to appleid.apple.com and generate an app-specific password. You can follow our video guide. It seems you haven’t followed our simple guide of installing IPA file on iOS. After drag and drop task, you need to allow unknown certificate. Follow Setting >> General >>Device Management >> Your Installed IPA >> Trust. You can always follow our video guide. High probability of facing this error may be the older version of Cydia Impactor. Download and install latest Cydia Impactor. It encounters because of improper internet connection. For removing this cydia impactor error, ensure you are connected to the internet with the firewall. If you’re using VPN, disable it. As the error depicts, you need enter app-specific password while sideloading IPA files instead of your Apple ID password. Go to http://appleid.apple.com/, log in using your Apple ID credentials and generate an app-specific password. Use it when you drag IPA on cydia impactor. Alternatively, you can just create a new Apple ID and give it a shot. This should eliminate cydia impactor 173 error. If it still appears, try disabling two-factor authentification and make an attempt using your existing Apple ID password. gnutls_handshake() failed: Error in the pull function. Check if you have a double certificate. Turn it off and give it a go. It is worth a shot for cydia impactor 182 error. It appears when Cydia Impactor doesn’t detect iOS device properly. Remove USB cable and reboot iPhone once. Reinstall iTunes and then follow the entire procedure. The simplest solution is to install iTunes that you probably forgot to install earlier. Your downloaded IPA file may be corrupted which is causing this issue. Download IPA file again from any trusted source. It is because of the lack of .app/info.plist. Find the file and replace it. The primary reason behind appearing this error is an improper archive of the original IPA file or download may be interrupted. Download it again or try out another IPA provider and sideload again. Restart the OS and try again. If still error occurs, download Cydia impactor 0.9.45 and try again. We have a code error 182. This is not familiar to us. We’ll try to troubleshoot it. 1. Open Cydia Impactor tool. 2. Select “Impactor” from menu. 3. Choose “Insecure SSL” which will save your selection. Now give it a try. If you are still facing the same issue, you may have probably double certificate. Turn it off and give it a try! Is your model present in the ipa list? Check it first. The “Network Extensions” feature is only available to users enrolled in Apple Developer Program. Please visit developer.apple.com/programs/ to enroll. I have this problem, any idea? 1. Use revoke certificate and try cydia impactor again. 2. If nothing changes, create an new apple id and use it when cydia impactor asks. Hey, I am getting ‘provision.cpp; line: 173; what: Please sign in with an app-specific password. You can create one at appleid.apple.com’ when trying to re-sign an IPA with the “Install Package…” option. I have been using Cydia impactor for a while now, but it only started happening recently. I would be happy to create a new app-specific password for it if need be, but it’s not even popping up asking me to give it a password in the first place. I have tried redownloading and reinstalling both Cydia Impactor and iTunes, so I really don’t know what to do. Instead of creating a new app-specific password, make an attempt with an entirely new Apple ID. If it still appears, disable two-factor authentification and give it a whirl. Hello, I keep getting this error can you help? The ‘Network Extensions’ feature is only available to users enrolled in Apple Developer Program. Please visit https:// developer.apple.com/programs/ to enroll. You are probably installing jailbreak IPA on your device. First, check if it supports your device. Make sure you change your flare according to your device. It is failing because the device you’re using may not be a 32bit one. Hi – I first used the v9.50 impactor but kept getting the 173 error. I’ve used the two-factor authentication password and this time it spitted out an error 79 (not listed above), saying that it’s installed as incompatible team. So I followed the instructions to remove the newer impactor version an downloaded v9.45 instead. 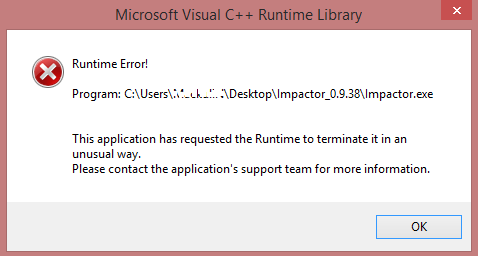 This time it’s error 62 but the warning is the same which says “application already installed as incompatible team. What can i do now? What is the app you are trying to install? Uninstall the current version of the app and try again. You can try disabling 2FA and use your Apple ID and password while sideloading via both v0.9.51 and v0.9.45. There may be a problem with the certificate causing such action. Navigate to Menu >> Xcode >> Revoke Certificates. Enter your Apple ID and password and revoke the certificate. I am trying to install whatsapp++ ipa file. I’ve tried apple id and password but if I do, i get the error that the password is incorrect or invalid. So i should uninstall v0.9.45 and reinstall which version? Where can I download impactor v0.9.51? Thanks. You are probably putting the wrong credentials. However, you can check it whether it’s working or not via Apple portal by signing in. On the other hand, have a look at the following video: https://www.youtube.com/watch?v=WfLM109DudA for a reliable solution. hello do you have a fix for error 557 yet?